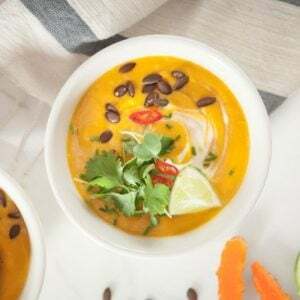 A luscious anti-inflammatory Thai Pumpkin Soup with turmeric, ginger, lemongrass, kaffir lime, chilli, cumin, coriander, coconut milk, and roasted pumpkin. Naturally gluten free and plant-based. 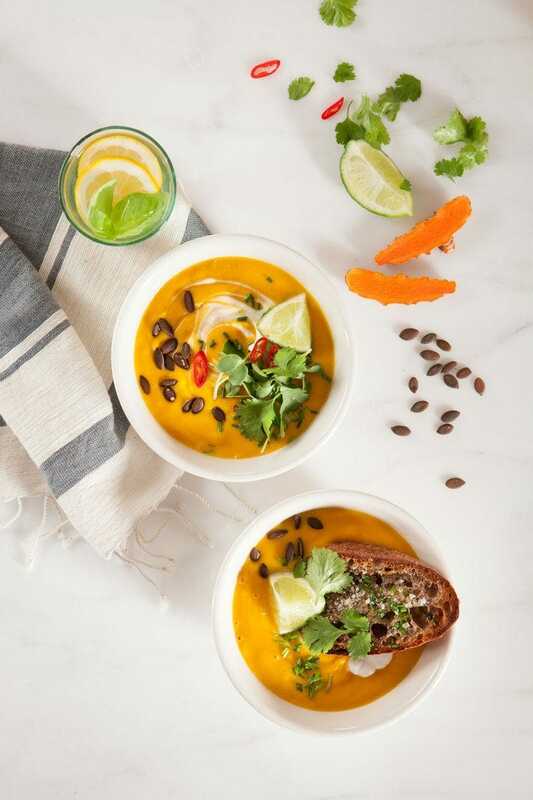 Pumpkin soup is certainly a classic – but the addition of these flavoursome herbs and spices take it from comfort food to a bowl of therapeutic goodness. 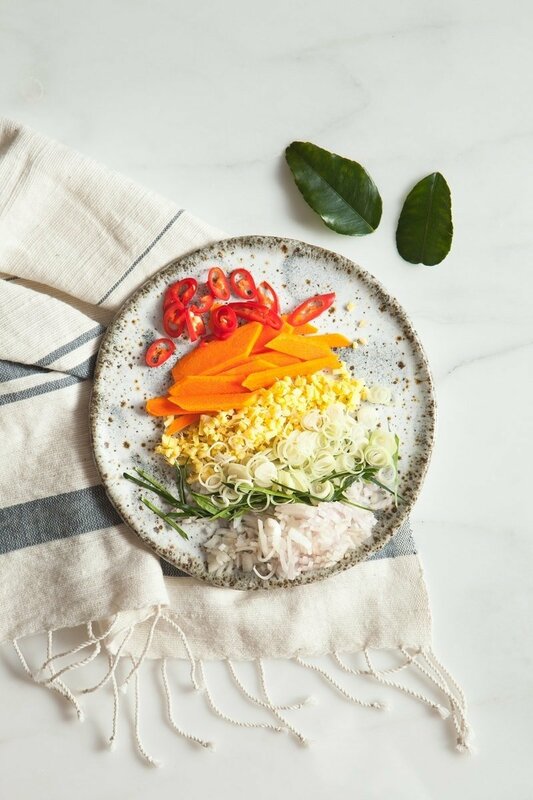 The key spices used are turmeric and ginger for their warming and anti-inflammatory properties. Turmeric, the Golden Root, a personal favourite for its natural anti-inflammatory and antioxidant compounds. Thought to have a tonic effect on the whole body according to Ayurvedic traditions, there is ample literature to support its positive effect on the cardiovascular, digestive and respiratory systems. It is also antimicrobial, anticarcinogenic and neuroprotective. 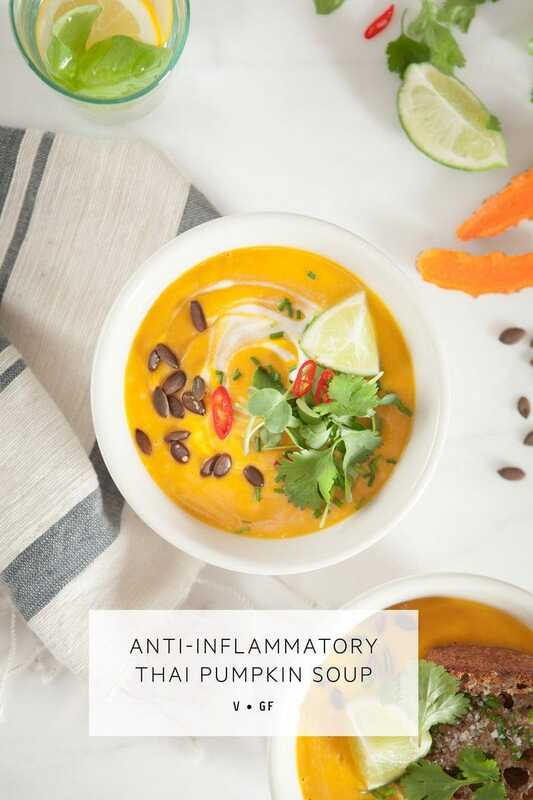 The antioxidant effect of turmeric has been shown to be 10 times more potent than vitamin C.
Fat and black pepper will aid in the absorption of turmeric – as it has a notoriously poor bioavailability. In herbal terms, turmeric is described as having the following actions; anti-inflammatory, antiplatelet (reduces platelet aggregation), antioxidant, hypolipidemic (lipid-lowering), choleretic (promotes the producton of bile in the liver), antimicrobial, carminative (relieves gastrointestinal gas), and depurative (improves detoxification and aids elimination, helping to clear build-up of metabolic wastes under the skin). Interestingly, when considering turmeric from an energetic point of view – it is warming, bitter and astringent. Bitter foods, herbs and spices are fantastic digestive remedies – they stimulate the secretion of gastric acids needed to break down food. This means turmeric has a net drying effect on the body – as ultimately these secretions are leaving the organs. Constitutionally, this may mean turmeric may aggravate someone who is already quite dry in nature. Ginger is another well known anti-inflammatory agent. As a circulatory stimulant, it also helps push blood flow to the periphery, aiding cold hands and feet. On that note, being prone to cold mits myself, iron, iodine and magnesium deficiencies can all contribute to cold hands and feet, as can suboptimal thyroid function. 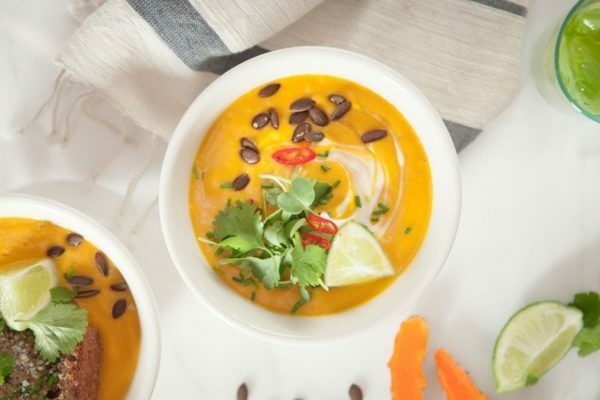 Pumpkin has a sweet but slightly cooling nature, and provides the precursor to vitamin A (a key nutrient in skin and immune health) in the form of beta-carotene. The natural fats in the coconut milk will facilitate the absorption of beta-carotene. Lemongrass contains essential oils that have been shown to exert potent anti-inflammatory and anti-fungal effects . It is particularly effective against candida in its vapour phase . As these oils are volatile, they will have evaporated off by the time you enjoy the soup, however you may be inspired now to use some of the essential oil in a diffuser! Tip – if you have leftover lemongrass you can freeze it for later use. Cumin, like ginger, is another pungent – meaning it will help promote circulation and increase metabolic rate. It also has carminative actions, helping relieve intestinal gas. Coriander seeds have traditionally been used to treat indigestion. The essential oil content has anti-spasmodic and carminative effects on the gastrointestinal tract. Modern literature has found the seeds decrease blood sugar and reduce insulin resistance . This is an incredibly easy recipe to prepare, and smells so fragrant as it simmers away on the stove. I like mine served with fresh herbs, toasted pumpkin seeds, a dollop of coconut yoghurt and a drizzle of fresh lime. Enjoy! 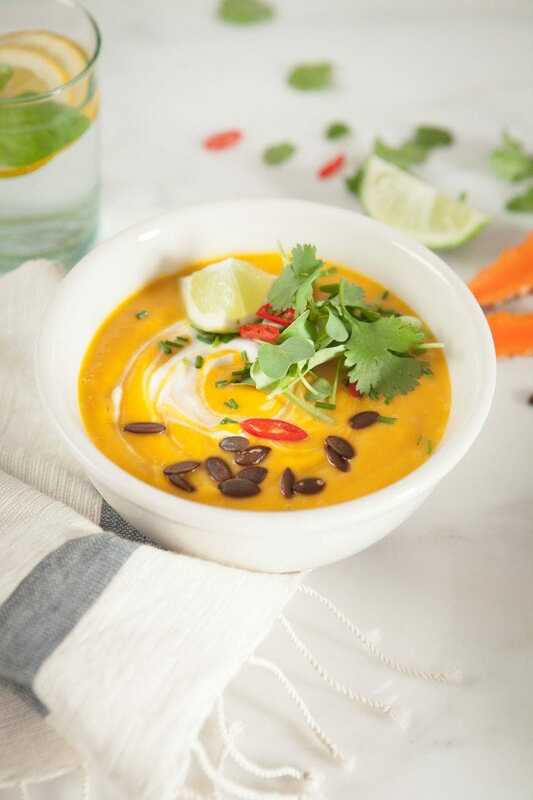 A luscious anti-inflammatory Thai Pumpkin Soup with turmeric, ginger, lemongrass, chilli, spices, coconut milk, and roasted pumpkin. Naturally gluten free and plant-based. Pre-heat oven at 180˚C (350˚F) forced fan, line a tray with baking paper. Peel and chop pumpkin, toss with coconut oil and roast till golden. Heat coconut oil in a large pot (medium heat), then fry shallots till golden, add cumin and coriander seeds and cook for a bit longer till fragrant. 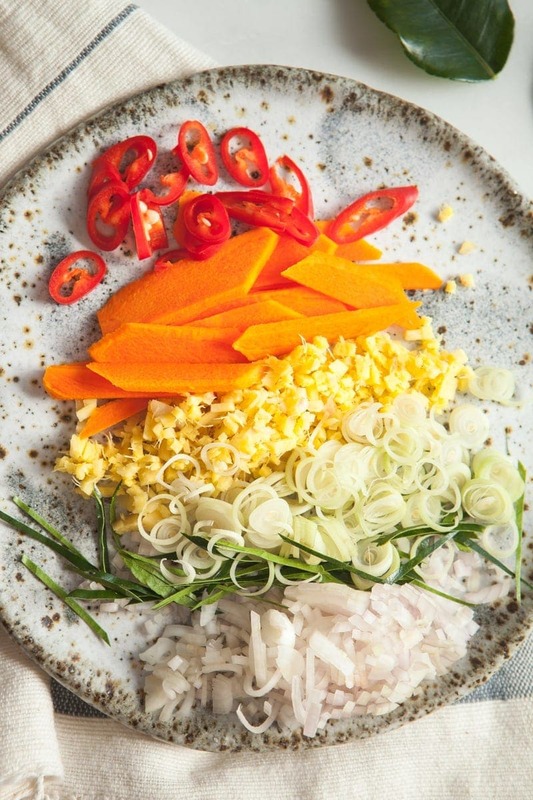 Add lemongrass, ginger, garlic, turmeric, chilli and kaffir leaves, cook another minute – but don’t burn! Add roasted pumpkin and stock, cover and bring to a boil, then let simmer for ten minutes. Add coconut milk, then turn up the heat and let it bubble away uncovered till it reduces down slightly for about 5-10 minutes. Once cooked, remove from heat and let cook a little, then blend till smooth and serve with fresh coriander and a squeeze of lime. You can add some other vegetables to the mix if you find pumpkin too sweet on its own, I often use a few potatoes and a zucchini. The thickness of the soup will vary depending on how dry/watery the pumpkin is. If you make and enjoy this recipe, please leave a rating! Boukhatem, M.N., Ferhat, M.A., Kameli, A., Saidi, F., & Kebir, H.T. (2014). Lemon grass (Cymbopogon citratus) essential oil as a potent anti-inflammatory and antifungal drugs. Libyan Journal of Medicine, 9. Tyagi, A.K., & Malik, A. (2010). Liquid and vapour-phase antifungal activities of selected essential oils against Candida albicans: microscopic observations and chemical characterization of Cymbopogon citratus. BMC Complementary and Alternative Medicine, 10.